Just completed a deal to get my old Sprint back. 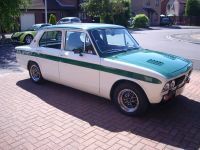 So I’m going to be a Dolomite owner after a absence of nearly twelve years. Just got to work out what engine she’s gonna get this time round. Just make sure the new engine doesn't rust proof my car like last time!!!! Didn't you get married in the interim? Have you run the decision past Mrs V8 yet? Welcome back all the same! How about a nice TVR V8? 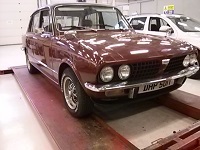 Married yes to Mrs V8 and is more than happy to have the Sprint on the drive than the Plastic Scimitar. I'll do my very best not to Rust Proof your Sprint again. Don't forget that Stag engine was changed for another Stag engine that didn't burn more oil than petrol. AJPv8 like the last swap just sold on eBay for £800 needing a rebuild lost oil pressure. It may be a more sensible engine choice this time round. Still waiting for the Sprint to come back home. Illness within Sprint owner's family. But a complete running and driving 230bhp donor vehicle has been sourced. And will be stripped out before Sprint comes home. I still have a picture you kindly took many years ago of the house in Epsom where my car originally came from. Glad you are returning to the fold. What’s the 230bhp donor car Phil ? It has 4 Spark Plugs?. And is 230 Standard without mods. I seem to remember you made the car 2 inches longer ?